When SHORYU ramen was opening their new restaurant in the Japan Centre, London, they came to Garment Printing to provide them with their printed staff uniforms. During the printing process, various other printing needs came up which were all designed to be used at their opening event. Again, Garment Printing were entrusted with fulfilling all of the printing needs that were required for this big launch event. 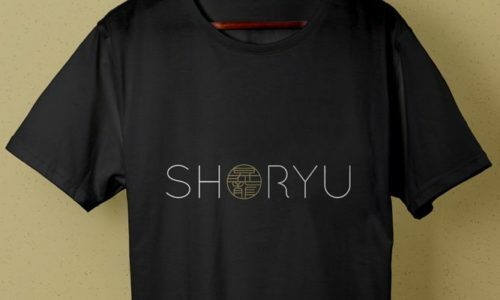 For the printed workwear, SHORYU opted for a simplistic design which featured their logo printed onto the front of plain black T-Shirts. The logo featured white lettering with a gold badge in place of the ‘O’. Soon after the printing was completed we were also asked to create staff T-Shirts for other store openings which were happening around the UK. It didn’t stop there for us either, we were also asked to produce loyalty T-Shirts, special Christmas T-Shirts, hoodies, long sleeved shirts, embroidered fleeces and vinyl caps for the Japan Food Festival. For the simplistic design for the restaurant’s work wear, cad cut vinyl with gold was used to get a real stand out sheen when against the black t-shirts. This ensured that the design stood out well and kept with the theme of the restaurants’ modern but simple interiors. After printing shirts for one restaurant, more batches followed with more staff and new locations opening up. Later, the client also started printing work wear for the Japan Centre, loyalty t-shirts, special t-shirts for Christmas, hoodies, long sleeves, embroidered fleeces or vinyl printed caps for the Japan Food Festival… To ensure full customer satisfaction, Garment Printing was always happy to provide samples before processing a bulk order.